There is a wide variety of classes to take, something that would fit just about anyone. Start planning for your growing season, or come get firearm training, or training about refusing to be a victim. More and more there is news about the crime rate here in Indy. Learn how to help prevent being one of those statistics. Pick and choose the classes you want to attend. 8-9 Introduction and starting your garden (FREE SEEDS), how to get started, and maybe learn some new tricks Slide deck available for a fee before, or after class. 9-11 Introduction to permaculture – Exact class that was part of MSE conference but reduced price. Slide deck available for a fee before, or after class. 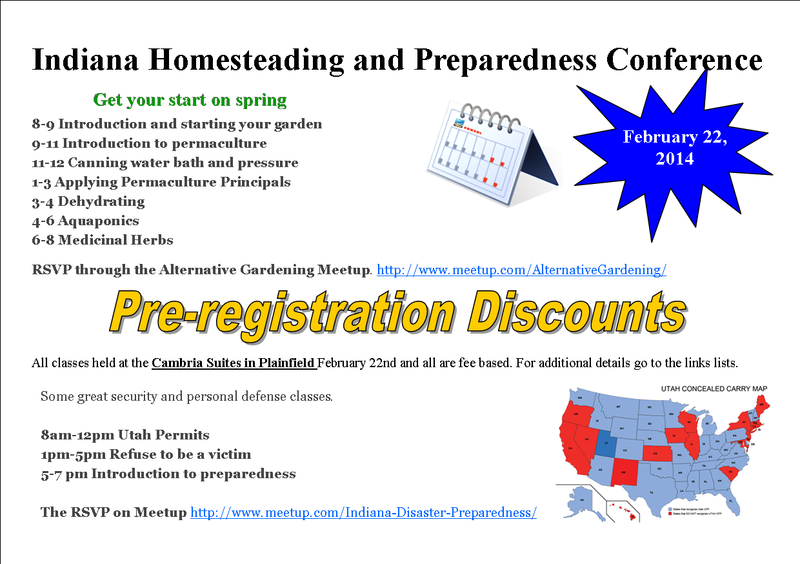 1-3 Applying Permaculture Principals -Exact class that was part of MSE conference but reduced price. Slide deck available for a fee before, or after class. 4-6 Aquaponics – Growing both fish and plants with no chemicals, more productive than ANY other agriculture technique per space. Slide deck available for a fee before, or after class. 6-8 Medicinal Herbs – What medicinal herbs you can grow, some potential uses, and preparations. Slide deck available for a fee before, or after class.